This figure is based off of Harley's Insurgency costume from Injustice: Gods among us. The paintwork is crisp and clear with little to no errors on my copy of the figure. She is covered in great little details from the buckles on her belts, to the joker-esque smile on her cut up crop top. Her jacket is impeccable and really looks great and hangs in a very natural looking way. Bandai has done a great job of hiding her mid torso joint using the shirt and jacket to completely hide the joint and make the figure appear seamless in her midsection. The faces are well painted and very expressive. It would have been nice to see separate eye pieces similar to the recent Figuarts Captain America to allow you to change her eye direction, instead her default face looks straight ahead, her smile looks in one direction and the grimacing face in the opposite. Her bangs/fringe is removable to change her faces and is a very small piece. This allows the sides of the head to remain fairly seamless and allow for a cleaner look than your traditional Figuarts or Figma. She has twin ponytails (one red one black) that are on rotating swivel hinges to allow her hair to fall however you see fit. Harley is capable of looking equal parts adorable and evil and I think Bandai hit a perfect balance with this figure. She is easily one of my absolute favorite toys in my collection currently. Harley Quinn has pretty much what you would expect for Bandai Figuarts when it comes to posability. Her head can go a full 360 as well as look up and down. It is hindered slightly when it comes to looking up and I do wish there was a smidgen more range. She has double jointed shoulders; one ball joint in the shoulder socket, one hinge(?) in the the arm. She has single jointed elbows but due to her sculpt you can still get her forearm as close to her bicep as looks natural for a human. She has hinged wrists, with ball joint connections for her hands. Via the ball joint, and twisting the wrist joint, you can get almost any position out of her hands. She has a ball joint in her mid/upper torso hidden by the layered material that forms her clothing. Her legs can go pretty much 90 degrees forward and back, and about 45 degrees outward with a thigh rotation hidden in the hip joint. Her knees are single jointed but much like her elbows they can reach a very natural range without folding beyond a point that starts to look strange. Her feet are fairly standard Figuarts, toe bend, ankle tilt and bend. In a surprise move to me her toes are die-cast! Harley comes with a variety of hands, She has 2 painted hands. 2 Gripping hands, 2 splayed/open hands, 2 closed fists, and one special hand to hold one of her other accessories, a tiny paper Joker playing card! She comes with 3 faces in total, a neutral, slightly smiling/creepy face that is looking straight ahead, A grimacing/angry face that is looking to her left and a wide Joker-like smiling face that is looking to her right. The dagger attached to her lower left leg is removable and has a small jester head on the handle. It slides into the sheathe without any issues and I don't see any paint rub at the moment. She also comes with her signature mallet. The mallet does feel a little light and hollow, but the paint work is very clean and crisp, there is a slight seam line around the middle of the mallet head but the paintwork does a decent job of hiding it. The targets painted on either end are a great touch when many companies may have just left them bare plastic. While I would have liked the mallet to have a little more heft to it, it is very easy for Harley to pose with and hold which may have been compromised with the addition of more weight. Her 2 pistols are my favorite accessories; They are made of solid Die-cast metal and have painted handles. She can grip these very well in her pistol hands and pull off a ton of awesome poses with them due to Figuarts fantastic wrist joints! When I first pulled them out of the package the weight and cold feel of the die-cast really surprised me. I have a few Figuarts but I think this is the first I have ever owned with die-cast content. 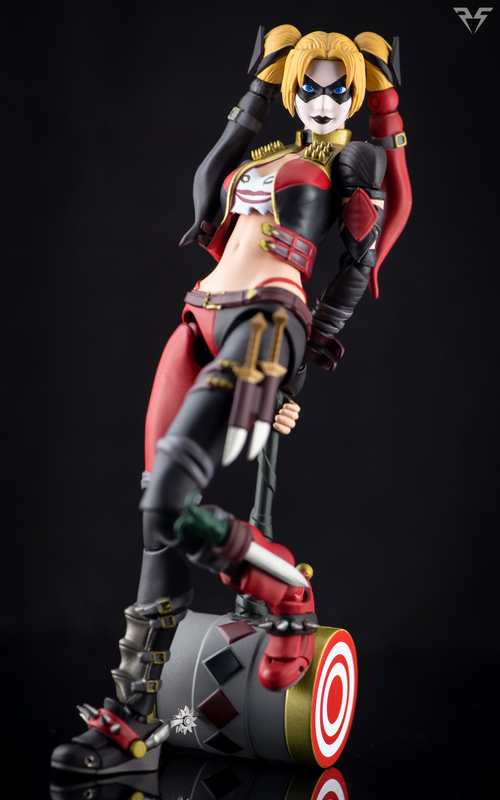 Despite a rather poor first taste of the Injustice license with Batman and Joker, Bandai has done an excellent job in redeeming themselves with this Harley Quinn figure. At the moment this is easily my favorite Figuarts, and one of my favorite toys in my entire collection. If you are looking to add a Harley Quinn figure to your collection and you don't mind the Injustice costume I would highly recommend this figure as possibly one of, if not the, top Harley Quinn figure available today. (In this scale of course, Sideshow's Harley Quinn is incredible for the 1/6 market.) 10/10, A+, Absolutely would recommend. Now to be fair, I did get her for the incredible price of $39.99 CAD, so my feelings may change if I was to pay her current $100+ price tag I've seen floating around. That being said if you got the cash I still think you would enjoy this figure for any price. Check out the massive gallery below and let me know what you think!